Shafter Lake, Texas, Andrews County ghost town. James T. Cumley, local editor, was Shafter Lake�s biggest booster. Cumley published glowing reports of the fledgling community in his newspaper and then sent copies out across the country, hoping to lure new residents. 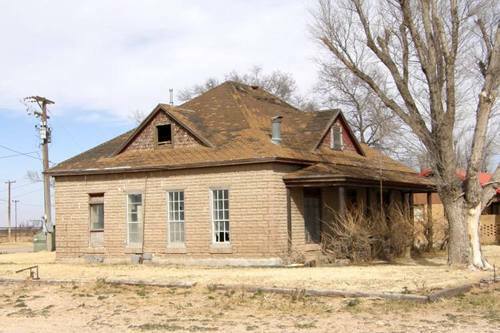 The town was platted in 1907 and before the end of that year, there were an estimated 50 houses. A post office was granted that same year and a cemetery was established the next. Plans for a railroad connection never materialized, but nevertheless, Shafter Lake reached a respectable population of 500 residents by 1910. 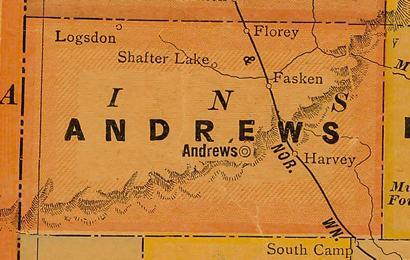 That same year the town entered into a �county-seat war� with nearby Andrews. 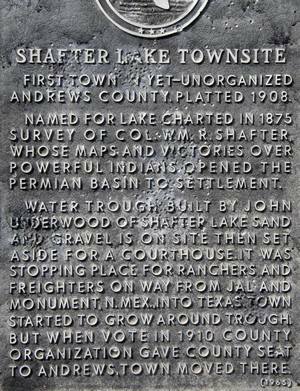 Shafter Lake lost and suffered the inevitable fate of towns that lose such fights. A large portion of the population relocated to the winning town, leaving little sign that the community once throve. Even the cemetery became a ghost � leaving behind the remains of the dozen or so people who had the misfortune of dying in a soon-to-be ghost town. Other structures now occupy the area but only the house remains of the original town.